14/8/12 - Acquisition - Madrid, Museo Arqueológico Nacional - Made famous by Goya’s portrait, Bartolomé Sureda y Miserol (1746-1828) directed the Royal Porcelain Factory of Buen Retiro, created in 1760 in Madrid by Charles III, in the style of the one the king had opened in Capodimonte - he even brought Neapolitan artists to Madrid - producing many pieces which were then to decorate the different royal residences. 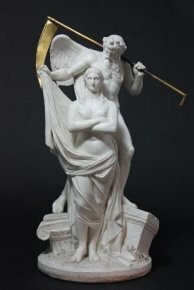 The Spanish government recently purchased Truth (ill. 1) for the Museo Arqueológico Nacional, for the price of 4,500 € at an auction in Madrid on 23 and 24 May 2012. 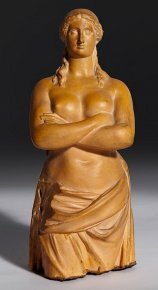 This is a terracotta cast for the group Time Unveiling Truth produced by the Madrid factory, for which the museum already holds the biscuit or unglazed version (ill. 2). Founded in 1867, the Museo Arqueológico Nacional, currently closed for renovation, holds in fact archeological, ethnographic, numismatic but also decorative arts works. This recently acquired statuette dates from 1806-1807, that is Buen Retiro’s "third period", that of Sureda. Three periods have been established for the factory production, each linked to different figures : José Gricci and Carlos Scheppers directed it between 1760-1783 ; then it was taken over by Carlos and Felipe Gricci between 1783 and 1803 ; finally, Bartolomé Sureda ran it from 1803 to 1808, making many changes. After traveling to England where he discovered the work at Wedgwood between 1793 and 1796, he went to France in 1802, and learned the secrets of hard-paste porcelain from Alexandre Brongniart, the head of the Manufacture royale de Sèvres. Buen Retiro produced a specific porcelain known as "porcelana de Madrid" made of hard-paste, with sepiolite, a material replacing kaolin. The models were very diverse offering colored and gilt decors for the platters and cups, but also white figures, representing mythological or allegorical subjects, inspired from antique statues, such as Venus and Cupid also residing at this Archeological Museum, contrasting with the more decorative production of the preceding years. In the same way, Truth remains impassive with her arms crossed while her veil is removed. With a figure somewhere between the Venus de Milo - though less supple, more thickset - and a statue from the 1930’s, this monumental matron is a "heavy" counterweight to the power of falsehood.